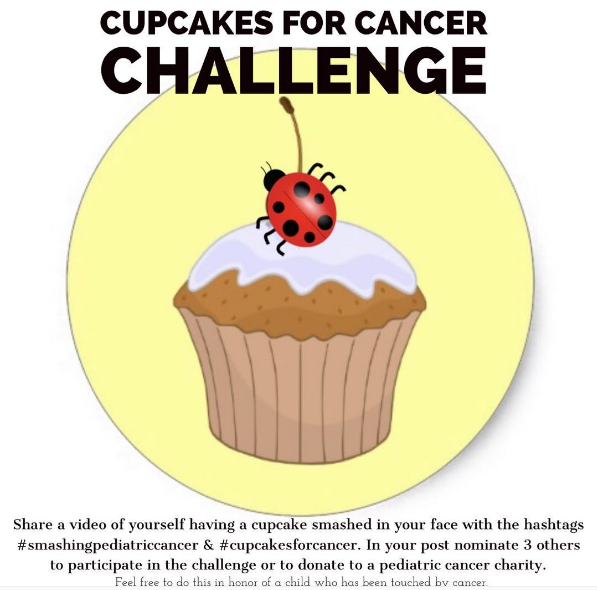 Time to mix up a batch of cupcakes, and join the social media challenge to smash away Pediatric Cancer! September is Pediatric Cancer Awareness Month, and to raise awareness for pediatric cancer, people all over are heading to social media with hashtag #smashingpediatriccancer. For this challenge you simply take a cupcake and smash it into the face of another person and nominate three other people to do the same. How fun is that? Joeys Fund was formed to support and raise money for those caring for children with childhood cancer. Our founders have experienced the struggle and stress of dealing with childhood cancer first hand and we love to see social media campaigns like this which raise awareness for these terrible diseases. Today is the last day of September, from all of us at Joeys Fund we challenge you to get your cupcakes frosted and use the power of social media to spread awareness! Share your picture via social media using the hashtags #smashingpediatriccancer or #cupcakesforcancer. Tag us as well so that we can share your pictures even after September is over! Nominate 3 others to participate and let’s see how many we can get on the last day of September! Check out this video of two children doing their part to smash out pediatric cancer! Awareness for pediatric cancer doesn’t end in September; we’ve got a great event coming up in October to check out. Joey’s Fund Charity Car show is a yearly event that we hold to raise money for Joey’s Fund to continue to help families struggling to care for children affected by cancer. Come and check us out on October 1st (Rain Date October 8th). Click here for more information! https://joeyscharityfund.org/wp-content/uploads/2016/09/unnamed.png 590 597 Joey's Fund https://joeyscharityfund.org/wp-content/uploads/2018/07/logo-1-290x300.png Joey's Fund2016-09-30 10:44:162016-09-30 11:59:15Smash Childhood Cancer!